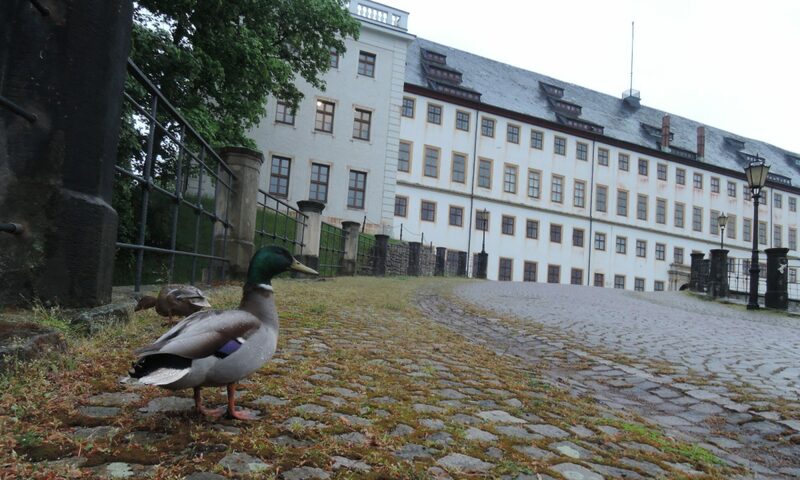 Am Donnerstag, den 11. 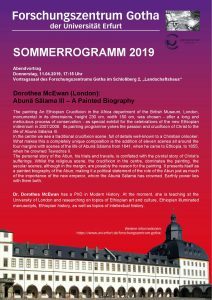 April um 17:15 Uhr, hält Dr. Dorothea McEwan (London) einen Vortrag zu „Abunä Sälama III – A Painted Biography“ und somit den ersten Abendvortrag unseres Sommerprogramms 2019. Alle Interessierten sind wie immer herzlich eingeladen. The painting An Ethiopian Crucifixion in the Africa department of the British Museum, London, monumental in its dimensions, height 230 cm, width 180 cm, was chosen – after a long and meticulous process of conservation – as special exhibit for the celebrations of the new Ethiopian millennium in 2007/2008. Its painting programme yokes the passion and crucifixion of Christ to the life of Ab una Sälama III. In the centre we see a traditional crucifixion scene, full of details well-known to a Christian onlooker. What makes this a completely unique composition is the addition of eleven scenes all around the four margins with scenes of the life of Abunä Sälama from 1841, when he came to Ethiopia, to 1855, when he crowned Tewodros II. The personal story of the Abun, his trials and travails, is conflated with the pivotal story of Christ’s sufferings. Whilst the religious scene, the crucifixion in the centre, dominates the painting, the secular scenes, although in the margin, are possibly the reason for the painting. It presents itself as a painted biography of the Abun, making it a political statement of the role of the Abun just as much of the importance of the new emperor, whom the Abunä Sälama has crowned. Earthly power lies with them both.